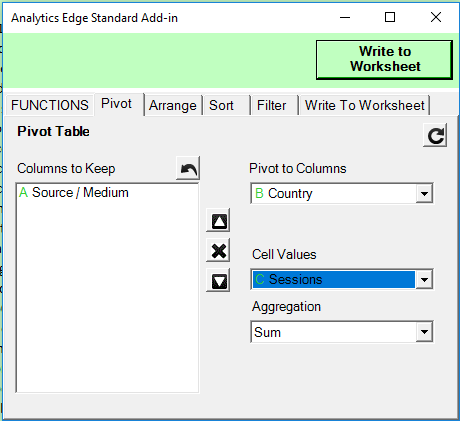 Analytics Edge add-ins are designed to be compatible with each other, so you can create a workbook with the Basic Add-in and refresh it with the Standard or Core Add-in. It is actually possible to create workbooks with the Core or Standard Add-in that can be refreshed with the Basic add-in BUT you can’t use any of the exclusive functions only available in the higher add-in. 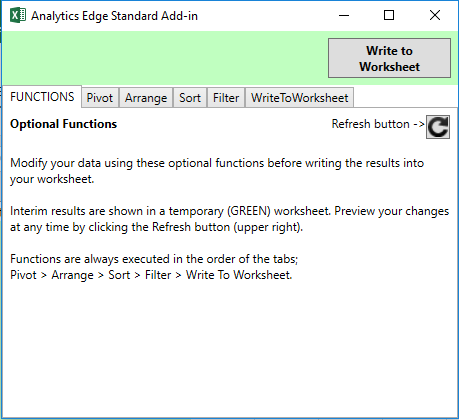 If you have upgraded to the Analytics Edge Standard Add-in, you can still emulate the behaviour of the free Basic Add-in AND produce compatible workbooks! Quick and Easy! Simply do NOT use any of the Pivot, Arrange, Sort or Filter options available only in the Standard Add-in. When the Functions wizard pops up, click the Write to Worksheet button. Do no use any of the other options in the wizard. Compatibility with the Core Add-in is also possible, but there is another restriction: no macros! Only Quick Queries are compatible, and like with the Standard Add-in, when the Functions wizard pops up, click the Write to Worksheet button. The Core Add-in’s Quick Queries are 100% compatible with the Standard Add-in, including all the functions in the pop up Functions wizard. The Standard Add-in cannot run macros.